If you find it let us know! Is our Australian friend, Kate, still around? Bookaboo is carefully crafted to inspire more children and grown ups to have fun sharing books together. 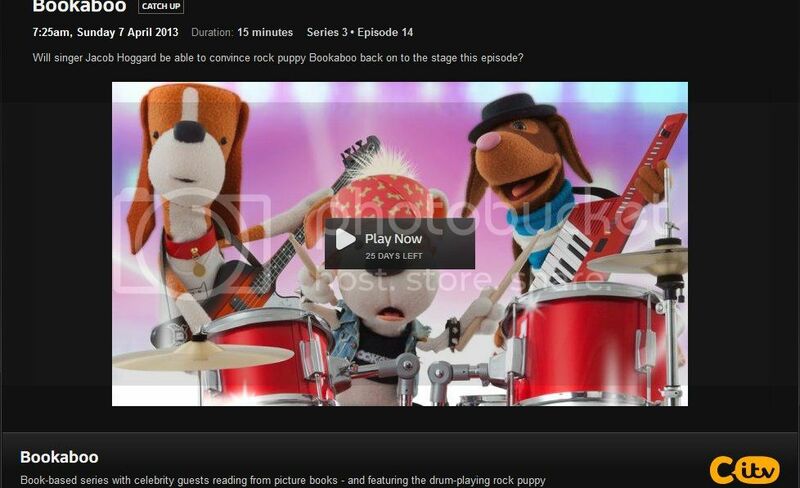 Bookaboo is broadcast on CITV in the UK, and ABC2 in Australia. I've tried to find it on YouTube but no luck yet. This man never ceases to surprise!! Yeah, I had a good look when I found the link. Hopefully it'll turn up sometime, somewhere! Looks like it's going to be airing in Canada on CBC .. This is the most detailed link I found: http://www.agile-ideas.com/bookaboo-back . "@maybeswabey: @bookaboolucy perfect cure to 2 hours sleep, Bookaboo toads on toast read by a hot rocker!! Phew"
Haha .. Only Jake could make that kind of an impression whilst reading a kids' book to a stuffed puppy. This is all I have found. Looks like it will be added to the Treehouse line up come fall. Nichole wrote: This is all I have found. Looks like it will be added to the Treehouse line up come fall. I think the Treehouse reference is for "This Is ..." not "Bookaboo", Nik. If you read further down in the article is says: Happy Films, the original series producer, will partner with Montreal-based Cite Amerique to co-produce 28 eleven-minute episodes of a new Bookaboo series for CITV and ITV in the UK and CBC in Canada. We may have to wait until it airs here to see/get this little gem. "Singer man" .... I don't know why, but I just love that line!